Fujitsu-ScanSnap-iX500-Scanner The ScanSnap iX500 starts with the touch of a single button and ends with a host of productivity features that keep you ahead of the stack. One button searchable PDF creation. Blazing 25ppm color scanning . 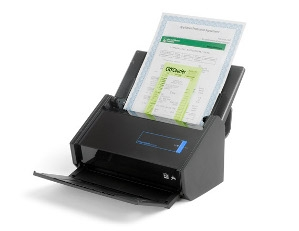 50-page Automatic Document Feeder (ADF) . Scan wirelessly to a PC or Mac. Scan wirelessly to iOS or Android mobile devices. Comes with Adobe® Acrobat® X Standard for Windows®.